As little as six grams of dulse seaweed has the same amount of iron as 100 grams of sirloin steak. Discover how this superfood is harvested. 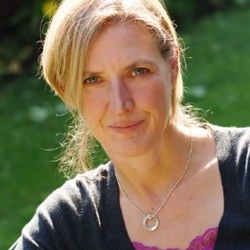 Xa Milne is co-founder of Mara Seaweed. Her love of wild edibles was cultivated while researching and writing a foraging column for the weekend Telegraph. 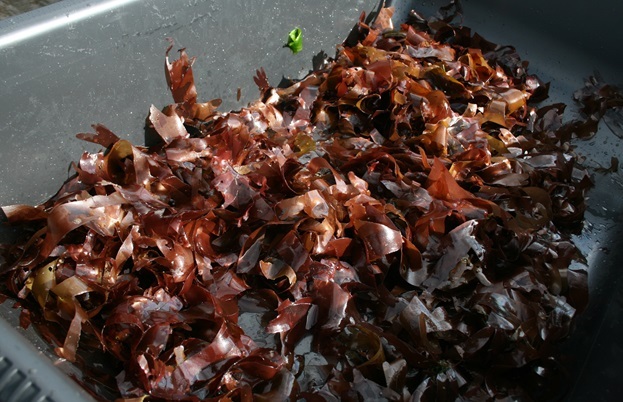 The very first time I harvested my own seaweed snack was in 2008 while doing research for a column and book I wrote with fellow foraging enthusiast, Fiona Houston (co-founder of Mara). We met Scottish restauranteur and seaweed expert, Margaret Horn, on her local beach, where she regularly snacks on dulse and looked twenty years younger as a result. The frilly edged seaweed fronds, which Margaret plucked from the shallows, looked good enough to eat. And we did. Delicate and translucent as gelatine leaves and the colour, somewhere between burnished mahogany and aubergine purple, its texture was that of smooth resin or high quality leather, not gloopy or slimy. It was clean and odourless, tasting a bit chewier than Parma ham, imparting a delicious intriguing, earthy flavour which deepened as you continued to masticate. I was instantly hooked. Later, Margaret rolled fronds of dusky pink dulse around a poker, and toasted it in the fire, until the weed squealed. She finished it off with a sprinkle of brine, because you almost can’t have enough salt. The end result was a snack with crisp and crunch, infused with a level of smokiness that wasn’t a million miles away from the taste of bacon. 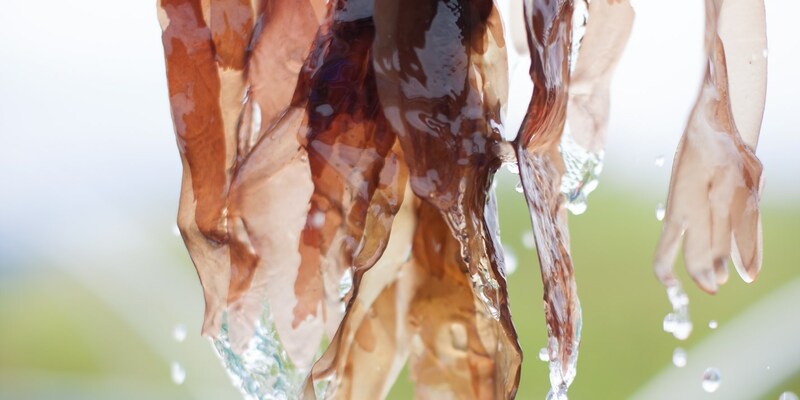 Dulse was the original bar snack, served up 100 years ago in taverns to stave off hunger and keep the ale flowing. Being an anti-oxidant and powerhouse of minerals, food doesn’t get cleverer than this; it can replenish the parts that need reviving. Margaret remembered the bad times when fishing boats came back empty; there was always the seaweed to fall back on. Her gran used to make a sustaining broth with potatoes, onions and dulse to nourish her family. Dulse has been valued since the age when Neolithic man walked the earth. Much like kale, this lowly food has a history of transforming itself through the ages, from crofters' food to Michelin chefs' go-to ingredient. Survival to revival in a short passage of time. Our 10,000 kilometres of coastline in Scotland gives us a unique advantage. Not being a seafaring nation anymore, it is now more about protecting our natural stock of green gold as part of Scotland’s treasure chest. 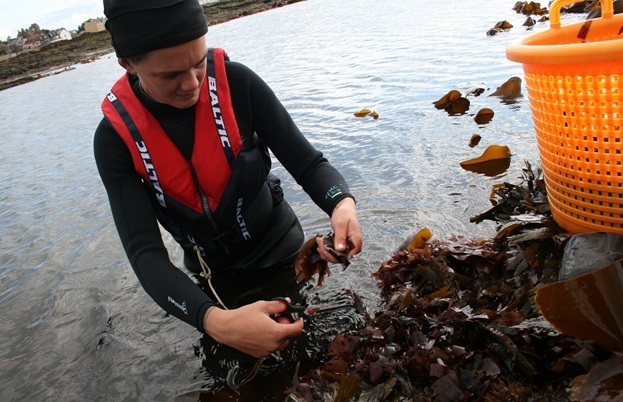 In 2011 Mara obtained the first license in Scotland to harvest seaweed, which we have been doing sustainably since then. Wild harvesting occurs at spring tides when there is either a full or a new moon. There are roughly two tidal 'windows' per month, so we harvest about twelve days a month when the seaweed is in season (sea vegetables have a growing season just like land veg). It’s not for the faint hearted or lie-a-bed types. If high tide is 7am, harvesters have to be in position on the beach, baskets in hand, high vis gear on, at least two hours before that! The optimum window for picking is based on the tide's punctuality. It has never been known to be late. The earth’s clock never stops. When the tide moves out, like a banker who has been stuffing notes in the bank vault, nature’s stock is revealed with all its raw beauty and bounty of seaweed spilling out of rock pools and onto the beach. 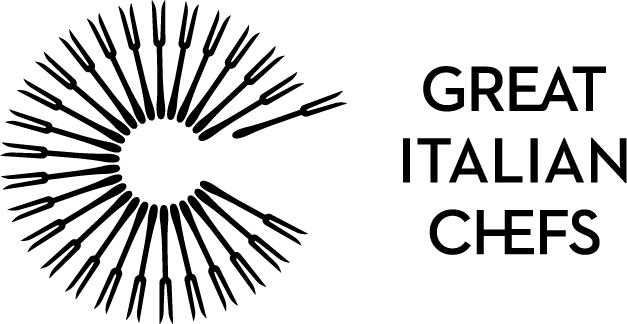 The rules are strict: the picking areas are rotated, according to season. Seaweed is picked judiciously, cutting two thirds of the way down the stem. This ensures re-growth, like coppicing trees or thinning plants. Like mushrooms, seaweed is its equivalent in the marine world. Seaweed also reproduces from spores. Each type has its unique growth cycle and they are only cut when not breeding. If this sounds like a lecture, it is only because we don’t want to have our license revoked. It is vital our company creates a model of sustainable harvesting, so the delicate marine structure can be maintained. Rory, our chief harvester, leads operations – he has been gathering seaweed for so long he practically has barnacles growing off him. An ex-marine lawyer, he is a stickler for adhering to the harvesters' protocol. Seasonally employed harvesters are clothed, marshalled, briefed, given designated areas to pick, and a strict timeline to stick to, and told to under no circumstances ever turn their backs on the tide. Gear must be warm and waterproof (gloves help, washing up ones will do). Baskets of seaweed get taken to a transport point, where they will be taken back to the processing hub and subjected to a rigorous QC checking system, which involves cleaning, rinsing and sorting the batches. Like vampires, the harvesters melt away as the sun climbs higher. It’s all done and dusted within a four hour window. They may be back later for the evening low tide pick. In the meantime, the bank manager puts the loot back in the vaults and pulls the slatted doors down.